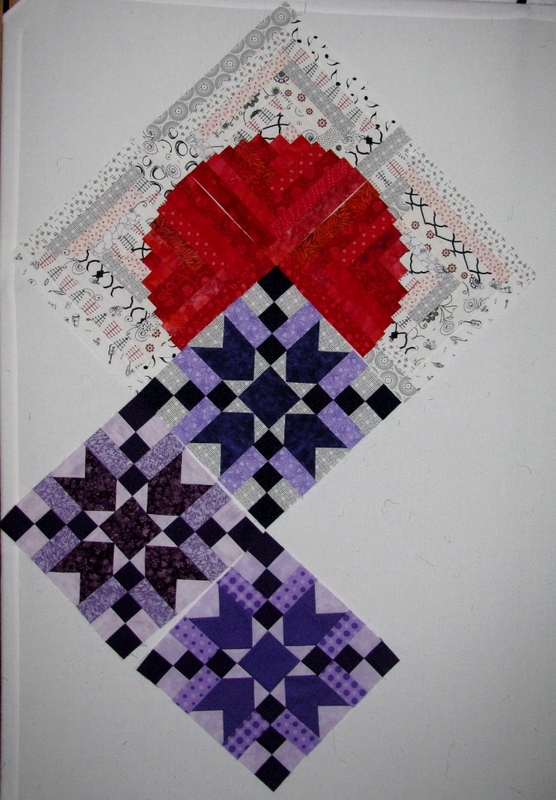 One of my 2013 end-of-year goals was to make a quilt using the Card Tricks block as a setting. It didn’t happen in 2013, but I am working on it now and it is going – sideways. The plan was to make 3 blocks of 4 different colors. 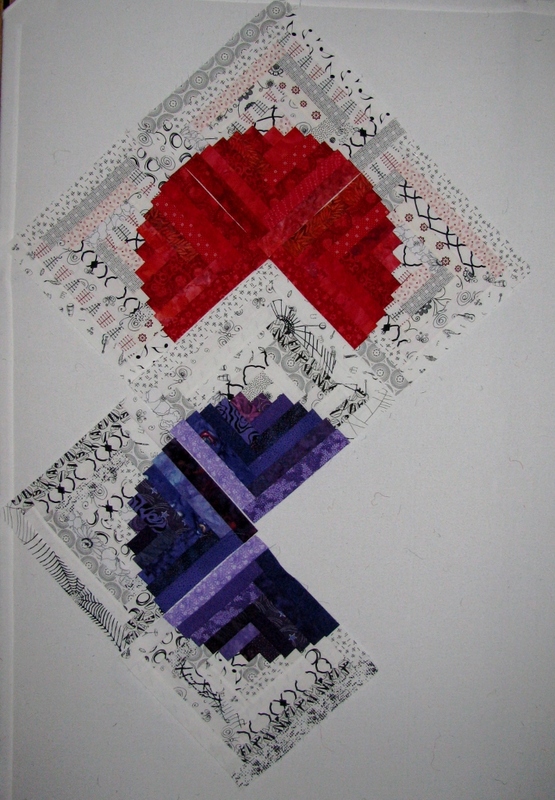 My colors are red, purple, blue and green and I trying to decide on blocks. The first block I picked was a log cabin variation from Judy Martin’s new book Extraordinary Log Cabin Quilts. It is a little hard to see with the white background against the white design wall. Purple was the second color so I picked out a purple star block. I liked the purple star blocks, but I don’t like them with the red blocks. I think that the reason is that there is so much white background in the red blocks, but very little in the purple blocks. To test that theory I made three purple log cabin blocks. 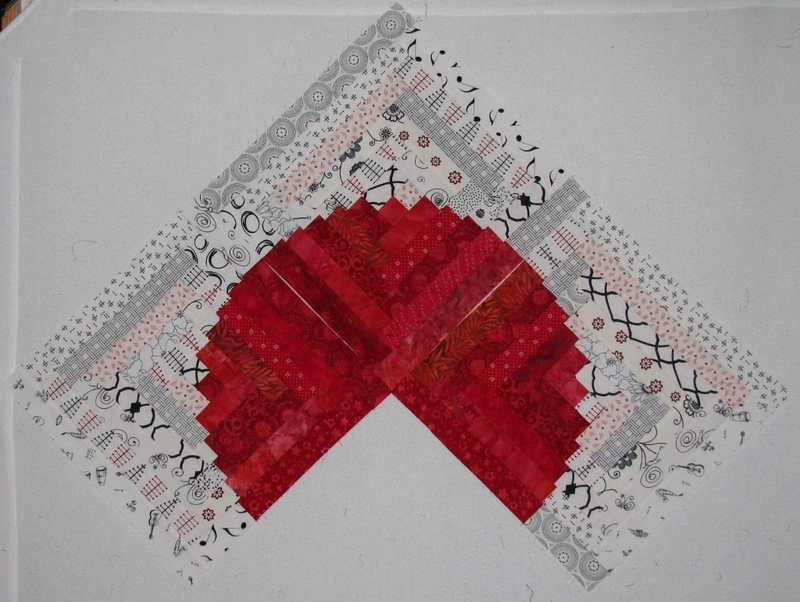 This isn’t the quilt that I was visualizing, but this is the quilt that is demanding to be made. Luckily purple is the favorite color of a quilt guild member and she gladly, gleefully took the purple star blocks. I really didn’t want to add a UFO to my list. Since my blocks were not playing well together, I decided to call this quilt Card Tricks Revolt. Now I am busy making blue and green log cabin blocks and thinking about borders. Don’t you love it when you can get something out of your UFO stack by simply passing it on? Works for me! PS: I can’t wait to see the finished product. It looks very interesting.